26 leaves : ill. ; 28 cm. "Presented at the Bellagio Conference, October 1977, Bellagio, Italia." Astolfo Fumagalli, Robert K. Waugh. Early in the 1970's, Guaitemaa took steps to reorganize the Public Agri cultural Sector (PAS) (ie the Governmental Sector). The principal changes were the unificat or of banking creditto, the establishment of a marketing institute, the reorganization of the operating armofgeneral services of the Ministry of Agriculture which includes extension, promo tion, supervised credit and other activities, and the establishment of a technological institute responsible for research and promotion of the use of technology. 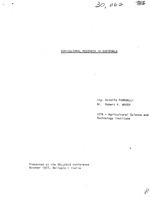 This is mainly a report of the latter mentioned institute, the Institute of Agricultural Science and Technology (Instituto de Ciencia y Tecnologla Agr!co!as -ICTA-), established in 1973, as it operates today within the Agricultural Sector. Ra i naf -1 s seatzra' M: r' 0 :7c mo'h of May through October. credit program, with funds furnished by the Agricultural Bank. vocational training program in agriculture. 3. Natural Resources (Recursos Naturales). Mainly irrigation Projects. research, which has now been transferred to ICTA. The country is regionalized and the Ministry and the autonomous institute use the common regional system. This allows Regional Committees to f as a sector within a region as parts of the national PAS, in order to coordinate regional activities. The reorganization of the PAS provided for these regional committees but they.only started to function in 1976. A com mittee is chaired by the regional representative for General Services of the Ministry of Agriculture. This system promises to be effe-tive and wil be mentioned along with the functioning of ICTA. The Board of Directors of the Institutes. The Minister of Agriculture is the chairman of the board of all the autonomous institutes. There are also other interlockings with the boards, which will be mentioned in the discus sions of ICTA. The Planning System. The Sector Planning Urit is directly related to the National Planning Council. In turn each Institute has a programing Office which relates to the planning system. The Coordinating Advisory Committee, is a cainmiztee of the Director of the autonomous institutes, as well as the Director of General services of the Ministry which functions as an advisory committee to the Ministry. The degree of autonomy of the Institutes, while not a complete autonomy it does allow considerable leeway for tihe Institutes :o develop programs, hire and fire personnel and make contractual arrangements. Also the relations with such national control bodies as the budget bureau and civil service are direct. Some controls normally applied to ministries do not apply to the Institutes and authority is given directly to the Director General of the Institute or to him and his Board of Directors. While controls are strict, resulting in cumbersome procedures, the degree of autonomy does allow more initiative to be exercised by the Institutes than by Ministerial organizations such as the General Services. With the establishment of ICTA research was moved from General Services of the Ministry to this decentralized Inztitute. However, ICTA is not viewed as a strictly research organization as will be explained more in detail later. improve the wellbeing of the population. 4. ICTA should promote the use of technology. 5, iCTA should promote regional rural development. of results obtained from research. In addition to the Minister of Agriculture, other members of the Board of Directors are the Minister of Planning, the Dean of Agriculture of San Carlos University and one citizen at large named by the other members of the board. This gives broad and powerful governmental representation to this board. and the head of INTA (agrarian reform institute, which is not a part of the PAS. ), are permanent advisers to the board, and are usually invited to the sessions of. the board, which meets about once a month. Thus the board is not only heavily governmental, but a strong PAS voice is present. that research results should not be considered the end product. CO"LABOR OVALLE" "CUYUTA" AND AND "SAN JERONIMO" "JUTIAPA" "CRISTINA"
initial resting and technical evaluation of technologies. not all in this list are technical disciplines. --part of a Commodity Team or a Discipline. All of these groups of the Technical Unit must work in a coordinated manner, and are focused upon a common technological system in which each group has a direct function within a production system. A TECHNOLOGICAL SYSTEM FOR PRODUCTION ICTA has developed a strategy or a group of strategies which might well be designated-a Technologica-l System for Production. -The diagram in page i4 is presented to 'llustrate this system. in alscussing this system by Phases, or by showing these phases in blocks in the d agram, there is no intention to indicate that these are separate ceps. in fact, to the contrary, the concept is that the technological system should be a continuum. Neither does the process necessarily start on the left and proceed to the right. If nothing existed a logical place to start might be with Phase 6, starting by obtaining agronomic and socio economic information to be used in guiding (or influencing) the other pha ses, However if no experience has been gained about all phases it is extremely difficult to start by collecting pertinent information from the farmers. 5., Foundations. Regional Organization,- etc. g I o0 c Inf:rnt etc. Phase 3 is a continuation of the research (Phase 2), conducted -h private farms mainly small ones 4n the case of ICTA, in specific areas by Regional Teams and covers a wide range of different kinds of experimentation, from generation of technology to validation of previously tested technologies, through plots seeded to give a better base for evaluation of the economics or technology, before presenting it to farmers. The design of the trials, the kinds of studies, depend on the level of the technology being advamred, the technology level of the farmers, the conditions of the area one might say-it depends on the status of the art. If there is adequate confidence in the technology, both from the viewpoint of production and economics, if it is possible to answer in the affirmative the question, "is this technology valuable for immediate use by the farmer? the technology is ready to be tested in Phase 4 by the farmer himself. If the answer is "No" or "Doubtful", it is information for the feedback system, must be improved or discarded. The farmer's test, is further continuation of the research.process,where the opinion of the farmer is key to the evaluation of the technology. This is a means of getting technology in the hands of farmers without exposing him to much risk, since the technology has been validated in the farmer's area. The success of this Phase depends upon cooperation of farmers, but finding cooperators has not been a problem either for the farm trials or for farmer's tests. 3. This 'test belongs to the farmer and he should pay for the imputs. never furnish the land nor the labor). total net return, though the cost may be greater. region to region from 1/6 to 1/16 of a mranzana). the farm trials and should be continued through the farmers tests. .t farmer's tests, can effect transfer on a large scale, However they were ro. visualized as generalizing the transfer to large production groups, butonly to start the process and establish a solid technological base. The farmers with which ICTA works in conducting farm trials and farmer's test are considered ICTA's .clients. These may represent and appreciable number of the farmers of the area in which the testing is done, but it in no way represents an extension system. The General Services of the Ministry has the responsibility of the extension of technology to the farmers. Therefore ICTA must consider the credit and extension programs of General Services of the Ministry of Agriculture as direct clients, and the farmers who work with them as indirect'"eclpients of the technology. This transfer to General Services has not been considered adquate. However, since the Regional Committees (See Page 4) have begun to function this transfer shoaid now improve. This year (1977), on a pilot basis in one region, ICTA and General Services are working together with farmers who have seeded farmer's trials,, the strategy being to put ICTA and General Services personnel together at the field level. ICTA has also worked with..two private groups, where the private organization is responsible-for the farmer's tests. In other words ICTA has made the technology.-available and the private groups have done the testing under farmer conditions, while ICTA only serves to furnish technological backstopping. This system seems 'to have merit and ICTA is studying the possibility of extending this arrangement to other private groups, such as cooperatives. and earlier within. the select ior. 3.The Regional Teams flow do mcist- of : i- '1-i work on soil fertJiflty,. snirt at the farm level, not on the ex;D rmenut stations. their traditional practices fai! at the same time. component should be well understood. distributed within the area. It is more efficient to select and delimit areas which can later be expanded with a minimum of cost and effort, than attemp to cover too large an area at the start. neglected within the ICTA system, and must now be given attention. international support, technological backstopping and training, can be of ".rst order of importance. But this international "dialog" must be made more relevant, more effective than normally ocurrs. he first point of good international dialog is that it should be two way and should not be an imposition. The national program can only be an equal partner in international dialog when it knows what is needed, what can be helpful to it. This clearly means that the national programm must have a good degree of capability to define its own technological problems. ICTA has taken several measures to improve this dialog and international help. has contributed favorably, in a major fashion, mostly from the international Centers,. CIAT and CIMMYT. This training program is in addition to short course training, principally at the International Centers and graduate training at universities. ICTA recongnizes that technology carried through the Technological System as conceptualized and practiced within ICTA is not everything.Credit, mar keting, infrastructure, availability of inputs are necessary. Thus there must be other. "systems" operating along with the Technological System,and requires the coordination of other institutions of the public and private sectors. The national-governments are the prime factors in food production an-d rural development. Population and food supply must be brought into balance, not just on a year to year basis, but over a long span of year-s. Latin America is presently in an enviable position when present food production and potential production is viewed in relation to the food demand, but is not taking advantages of this favorable position to assure the continuation of this position over a long span of years. How to mount rational demographic and food production programs is a political problem because tetim span necessary for programs to be effective is longer than the short term interest of politicians. ICTA is not just a research organization, nor research results its end product. ICTA is a technological organization, using research as 'a tool to develop technology, which is throughly tested and validates, by scientists and farmers, before being promoted for general use. ICTA has the responsibility to generate technology and promote its use. As to the generation and validation of technology, the first few year's experience indicate that the system is a good one. Promotion of the use of technology, as a major responsibility, is not interpreted as operating all or even-the major transfer mechanism, but in finding means to backstop the transfer mechanisms, and to help them to effectively transfer technology to the producers, and within the limited experience of ICTA the strategies discussed herein show promise of being effective. ,.s la Institucion de Derecho Priblico responsible de general y promoter el .-,so de la Ciencia y Tecnologta Agricolas en el sector respective. En con zecuencia le corresponded conducir investigations tendientes a la solu-cion de Jos problems de explotacion rational agrfcola que incidan en el Dienestar social; producer materials y mi todos para incremental ]a pro:;jctividad agricola; promoter la utilizaci6n de la tecnologla a -nivel del acricultor y del desarrollo rural regional, que determine el Sector PO-biico Agrtcola. 5a. Ave. 12-31 Zona 9. Edificio "El Cortez"